Chandler Mobile Auto Repair, in Chandler, AZ. is here to help you most, no matter wherever you are. Nobody wants to spend their hard earned money and time waiting on an automobile repair shop to fix their car just to have the same problem the next week. That's why Chandler Mobile Auto Repair, offer on most vehicle repairs! You can breathe easy knowing we stand behind our work. Your receipt will specify if there is an extended warranty. Chandler Mobile Auto Repair, in Chandler, AZ. perform many repairs on a vast majority of vehicles on the roads today such as GM, Ford, Chrysler, Honda, Nissan, Mitsubishi, and many others! We are equipped with the tools and the expertise needed to get the job done. If you drive it, we can most likely work on it! Give us a call today! We will dispatch a mobile mechanic to your location! One thing, you will have to always remember and that is, if you don't get a reliable and trusted mobile mechanic then you may lose your valuable time and wallet. So, just find us and call us Chandler Mobile Auto Repair will reach out to you within a very short time, no matter wherever you are in Chandler, AZ. 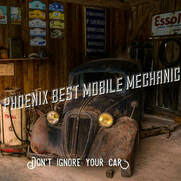 Chandler Junction Mobile Mechanic : 602-975-4967 Mobile Mechanic Chandler, AZ.